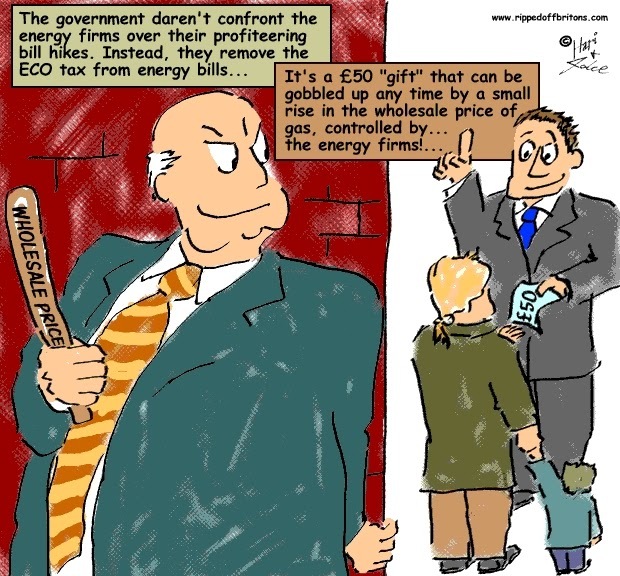 The government has removed the ECO “green levy” on energy bills, to save consumers £50 on average. A government spokesman said the 40% of ECO spent on insulating the homes of the fuel poor had been protected. But most of the saving comes from cutting the requirement for energy companies to insulate hard-to-treat properties. Derek Lickorish, chair of the government's Fuel Poverty Advisory Group, warned: "The £50 saving, as welcome as it is, could be gobbled up by a small rise in the wholesale price on the global markets." Consumer Futures, the UK's official consumer watchdog, said: "The review to cut bills has failed consumers by cutting the only levy, ECO, that directly helps them." Caroline Lucas, the Green party MP for Brighton Pavilion, said: "Watering down our energy efficiency commitments at precisely the time they are most needed will mean more cold homes, more winter deaths, and job losses in the construction industry."